Outpost Caretakers Week 22 ~ What To Say? I’m going to have to dig deep this week to find something entertaining to talk about. It has been a time where the days come and go without much change, each just a repetition of the other. The weather has gotten a bit warmer and the mornings while still chilly (inside) aren’t the frigid temperatures that required streaming mugs of coffee to warm my hands and a blanket across my legs. I’m down to my normal 3 layers of clothing and for several days this week you could almost feel that spring was in the the air. On one of these days I did get the chance to do something I haven’t done since maybe October and that was to sit in the sun. Now I had to go to the far end of the beach over by our satellite dish to bask in it and it really didn’t have any heat and it only lasted for 20 minutes but that was enough time to take in some natural vitamin D.
With this almost balmy feeling in the air we took some much needed time outside. Windows got washed, the boardwalk got swept, fallen branches from previous wind storms collected and dragged away, walks along the beach. This reprieve from the rains lasted for 4 days. Life back inside the lodge returned to surfing the internet (still planning that perfect trip) working on my puzzle, watching a movie in the afternoon ( really should stay away from ones with a theme of a couple in a remote house where there are terrorized by brutal killers ) and reading. “Lost in Shangri-La” by Mitchell Zuckoff is what I am reading at the moment. A true life story of survival, adventure, a rescue mission and lots of history on the island of New Guinea in 1945. It’s kept me up till the wee hours of the morning. One small part of our (my) life that is different is I am now having to wash our clothes by hand. Last week the washer decided to stop washing. It’s not all bad, the spin cycle still works and if you have ever had to wash sheets and towels by hand you know that twisting the water out is the hardest part. So the commercial size kitchen sinks now do double duty while the washer takes care of the hardest part. Ken is going to try to get a new one on the next barge trip…another reason to look forward to that elusive vessel. With a full moon this week the tides have been higher than usual and brought in more driftwood. I’ve mentioned before how we’ve had more logs in the bay this year than last but they have never been a problem or caused damaged until the other day. 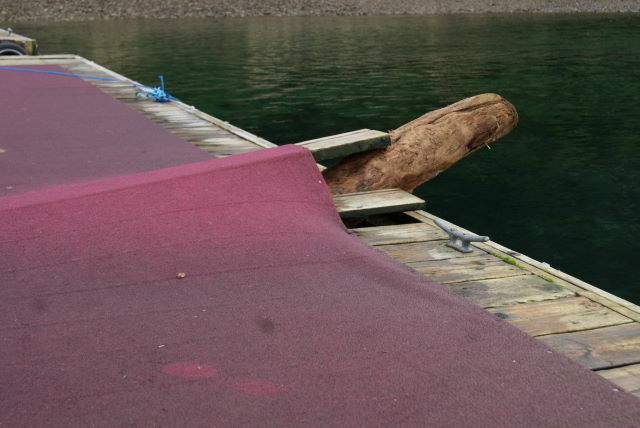 How this log managed to jam itself under the float is a mystery. Mike’s addressed it with a sledge hammer but it just isn’t going to budge so it looks like we’ll have to cut the carpet and than with a couple of crow bars pry the planks up. With any luck we should than be able to push it away. A brief bit of sun breaks through the thick layer of clouds highlighting a swath of forest. 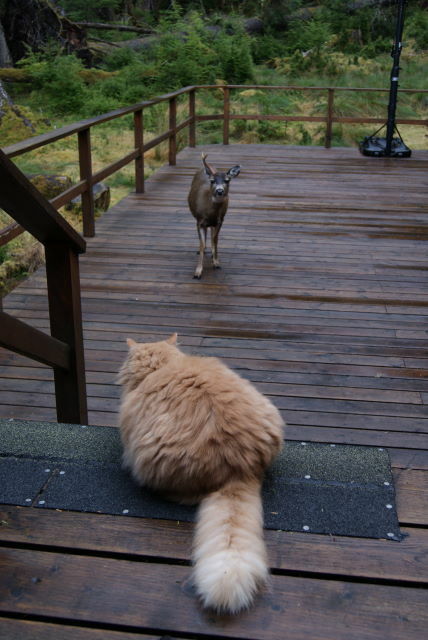 I have no idea what Norman was thinking when he decided to come up on the back deck but once Princess came into the picture he ventured no further. I wonder how close he would have come?